Opening reception June 5, 6:30 p.m.
Ed "Big Daddy" Roth: You're probably familiar with the name, especially if you're 40 or older, and had any interest in the counterculture of the 1960s and '70s. Roth was known for his instrumental role in the car culture of the period with his eye-popping, outlandish custom car designs, as well as cartoon characters like Rat Fink—a crazed rodent with a manic, ravenous grin and bulging eyeballs—a weirdo answer to Mickey Mouse. But there's another side to the larger-than life figure, who was a Utah resident, living in Manti until his death in 2001. The exhibit Rat Fink! collects the art of Roth—in addition to fellow hot-rodder Von Dutch and outsider artist/Juxtapoz Magazine founder Robert Williams—for the first time in Utah, at the Granary Art Center in Ephraim. For Laura Allred Hurtado, global acquisition art curator for the LDS Church History Museum, who is guest curating the exhibit, it was a bit of a stretch from her usual subject matter, but she found commonalities in his work. "I was involved with the Granary when I curated their inaugural exhibition [in 1991], so their mission—to exhibit local, regional and international artists, with particular attention to place and community—had been on my mind," she recalls. "Within that time frame, Ed Roth emerged as both a regional and an international artist who not only stood as an icon for custom car ethos and all the alternative subculture that came with it, but also, his legacy has come to shape and inform the small town of Manti with the annual Rat Fink car show and reunion. ... Thus, the effect of community follows Ed into Utah, and his creative production comes to shape that place as well." A convert to The Church of Jesus Christ of Latter-day Saints in 1975, Roth didn't just pay lip service to his faith but actively embraced it while continuing his design work. He was even invited to deliver a lecture at Brigham Young University in 1999. "As much as he stood for the counterculture that resisted the pristine-ness [and] squeaky cleanness of Disney, he was fully converted to Mormonism and moved to Manti to be close to the temple," Hurtado notes. "But this transformation doesn't equate to a rejection of his cultural projection, or his unique way in which he saw the world. Nor, really, is it a rejection of his [sense of] rebellion. How else is one to rebel when tattoos become common? In the world of custom cars, Mormonism is super-strange, very out-there." 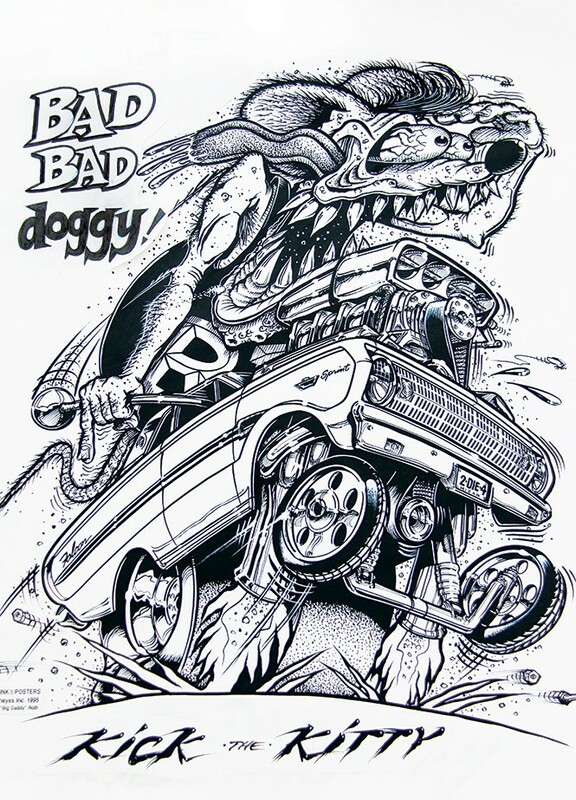 Jeff Decker, who met Roth growing up in Southern California when his father worked with Roth at Cars of the Stars, later sought the artist out in Manti, and was surprised to find Rat Fink emblazoned on signs reading "Slow Down," "Watch for Children" and the like. "The cartoon character who used to frighten me as a child was now on these gentle messages," Decker recalls. Although Roth traveled in the circles of the hot-rod crowd, his work had a relationship with more elevated Pop Art of the '60s and beyond, which often appropriated images from the worlds of comics and advertising in the service of ironic commentary. His commentary came from a different direction, but art aficionados like Robert Williams were eventually drawn to his effusive style, and artists like Roth helped blur the line between highbrow and "outsider" art. Several of Roth's works even take a tongue-in-cheek look, at fine art. One is Roth's re-creation of Picasso's Three Musicians; another is a re-creation of the René Magritte painting Time Transfixed. "These references to cubism and surrealism are important because, like Pop, they are terms ascribed to his work," she notes. "But Roth deconstructs these paintings by inserting Rat Fink, who dangles from the train emerging from the fireplace in Time Transfixed, and places the rat at the foot of the musicians in the Picasso." In the stylistic mashup that is contemporary art, Roth seems more relevant than ever. The Huntington Museum mounted a show featuring Von Dutch, Robert Williams and Roth recently, and the Los Angeles County Museum of Art currently hosts a traveling retrospective of Williams' work. "In my professional work with the LDS Church, I am continually on the hunt for talented and complex artists who are Mormon. Roth's work is that in spades," Hurtado explains. As much as Ed "Big Daddy" Roth's work was an outspoken, fantastical thumb in the eye of mainstream culture, it was also about community—whether hot-rod enthusiasts, counter culture "weirdos" who didn't fit in to mainstream society or the rural LDS community to which he migrated. Still, Roth's art is on display—and that's just cool. "Sure, it makes the Granary cool," Hurtado admits, "and it expands the gallery's audience outside of the art world. But I also think that the Granary is the right place to host such a show—there in Ed's backyard, among his people."